Sugar is an incredibly addictive substance. Sugar is “as addictive as cocaine.” In order to say sayanara to your sugar cravings, you must stop eating sugar, plain and simple. The less you eat it, the less you crave it. Easier said than done, I know, but that’s the necessary first step. The good news is – once you do this, cravings diminish quickly and dramatically. Now that you’ve cut out sugar, what can you eat? Focus on eating the most satiating foods: fat, fiber and protein. Fat, fiber and protein will keep you full and keep your blood sugar steady. Have avocado, nuts and coconut oil for healthy fats. Eat lots of veggies for fiber. And have lean meats, eggs, fish and beans for protein. So this means breakfast might be a protein shake, with some coconut oil added, plus some chia seeds or ground flaxseed for fiber. Lunch or dinner might be salmon (protein and fat) over salad and veggies (fiber) with avocado (fat). The mind is always racing outwards, chasing the next bit of stimulation – whether that’s checking your iPhone for new messages, or thinking about the next meal or sweet treat. Through meditation. Through my daily meditation practice, I’ve witnessed how restless the mind is, always chasing the next thrill. Slowly, gently, persistently I work to return to the present moment. This actually helps to unravel cravings so they don’t have such a strong pull. Every time I’ve done the Be Well Cleanse, it has helped to nip sugar cravings in the bud. The Cleanse shakes have lots of protein, which helps to keep blood sugar steady. They have fiber which makes me feel full and satisfied. The two week detox gives me plenty of time to re-discover healthy meals and snacks, and get serious about avoiding some foods that sneak into my diet like caffeine and too much dark chocolate. The best part is that on the Cleanse, sugar cravings disappear pretty immediately. 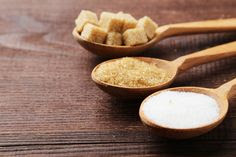 Often you crave sugar because your gut is hosting yeast and those little critters love to feed on sugar. The way to “starve” the yeast is by not feeding them sugar. Digestion starts in the mouth. Digestive enzymes start the process of breaking down starches into sugar. When you cut out processed foods from your diet and chew your food well, you’ll start to notice the natural sweetness of fruits, vegetables and even brown rice.